The iconic Villa La Vigie. Image courtesy of Monte-Carlo SBM. Nomad, an exclusive new travelling exhibition for collectable art and design, will be holding its first instalment in Monaco this spring. The showcase will bring together some of the world’s finest art and design galleries to offer highly sought after works alongside special installations and projects with the aim of holding the event annually in the finest buildings around the globe. 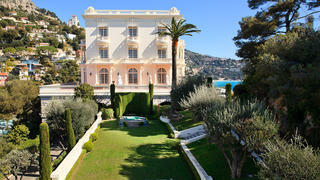 The debut edition will be held at the iconic Villa La Vigie. One of the oldest and grandest houses in the principality, it boasts expansive views over Monte Carlo and was formerly a private residence of the Moneqasgue family before being bought and renovated by Karl Lagerfeld. Now available for private hire, each room of the mansion – including bedrooms and bathrooms – will play host to a participating gallery. Thanks to the connections of founders curator Giorgio Pace and architect and Carwan Gallery co-founder Nicolas Bellavance-Lecompte, these galleries are certainly names of note. Alongside a huge span of Russian objet from the Heritage Gallery in Moscow will be intriguing furniture design by Copenhagen’s Etage Projects and a huge Arik Levy sculpture on display at the Louise Alexander Gallery. Also look out for works by Ayala Serfaty and Nacho Carbonell at Galerie BSL and pieces by London’s bright young things from Gallery FUMI. Held to coincide with Art Monte-Carlo, a shuttle bus will be on hand to ferry guests up Monaco’s famously arduous hills, with a jewellery and sculpture installation by Christophe Graber and a special projects created in collaboration with the Serpentine Gallery making it well worth the journey. However, with only 15 carefully selected galleries allowed to participate, Nomad is strictly for serious collectors and guests must demonstrate credentials in the way of museum affiliations and previous art purchases to gain entry. However, once you’re in the buying and networking opportunities abound with a series of talks, dinners and events at La Vigie and some of Monaco’s other prominent private houses. Nomad will take place from April 27-30, 2017 at Villa La Vigie, Monaco. Apply for tickets at nomadmonaco.com.